As you’re probably aware, I’ve been hooked on the large scale vehicles lately, and this is the latest addition in LEGO’s large scale vehicle arsenal, and it’s a beauty. 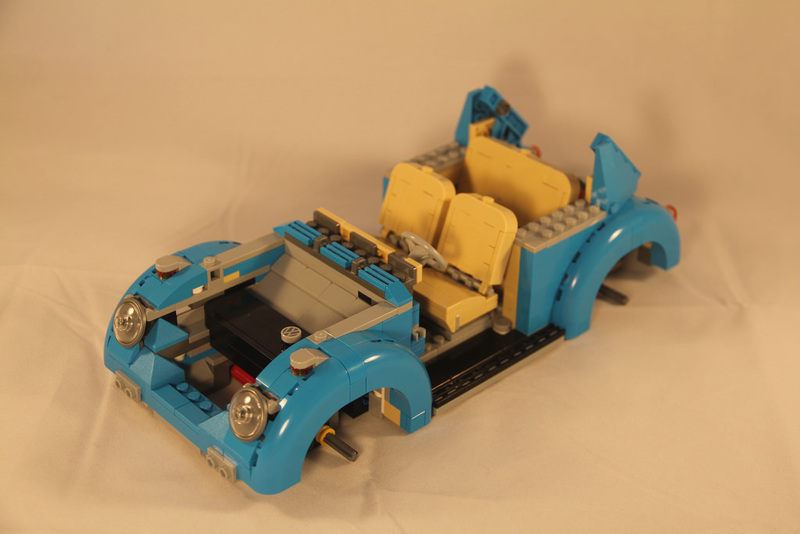 The internet went pretty nuts about this set when it was revealed, as it was a huge change from the last Beetle, 10187. Inside the box you’ll find eight bags of parts, four loose tyres, a sticker sheet and instructions. As far as elements go, this set is leading the way. 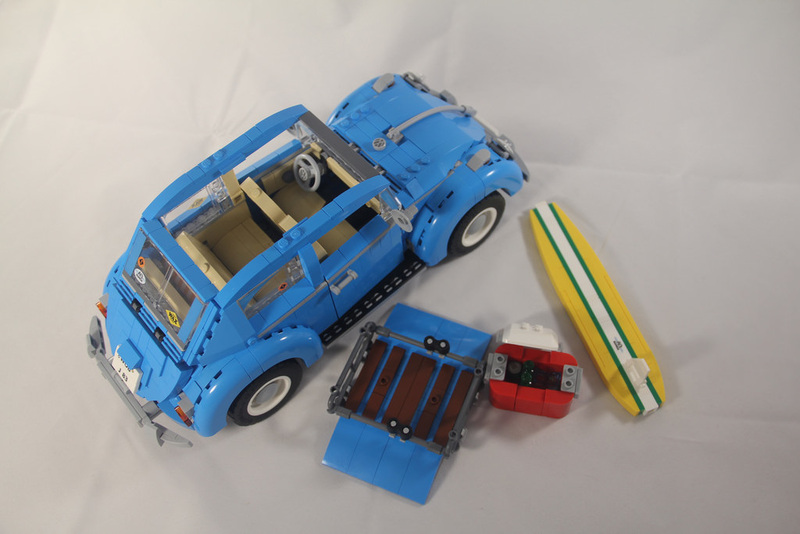 There’s only one new part, the stunning wheel arches (6x6x2 round brick), but there’s a whopping 24 moulds that have been recoloured to medium azure, some of which have more than 20 included. These 24 have never been seen in a set before, and then there’s more that have only been seen in less than a handful of others, so it’s a stunning parts array. 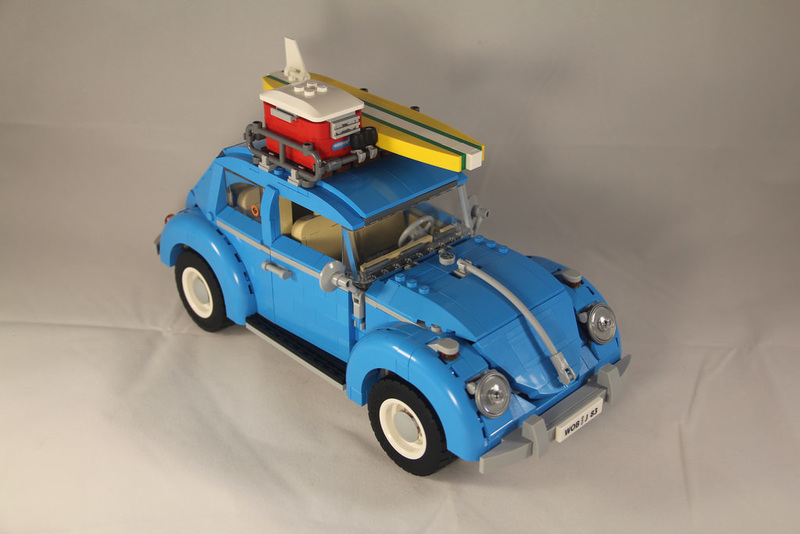 Some parts are printed, including the VW logo used on the fuel cap and on the bonnet, and the top of the can in the eski, as well as some spares. Some other noteworthy inclusions are the 1×1 half circle tiles in medium stone grey and transparent orange, the yellow 1×10 bricks with bow that are used at the top of the surfboard, windows, balustrades, towel and tubes to name a few. That colour though! Medium azure is one of my favourite LEGO colours. It’s bold, bright and cheerful, and makes for a stunning showpiece. As with the other large scale vehicles LEGO has produced, these aren’t really made for driving across the carpet. 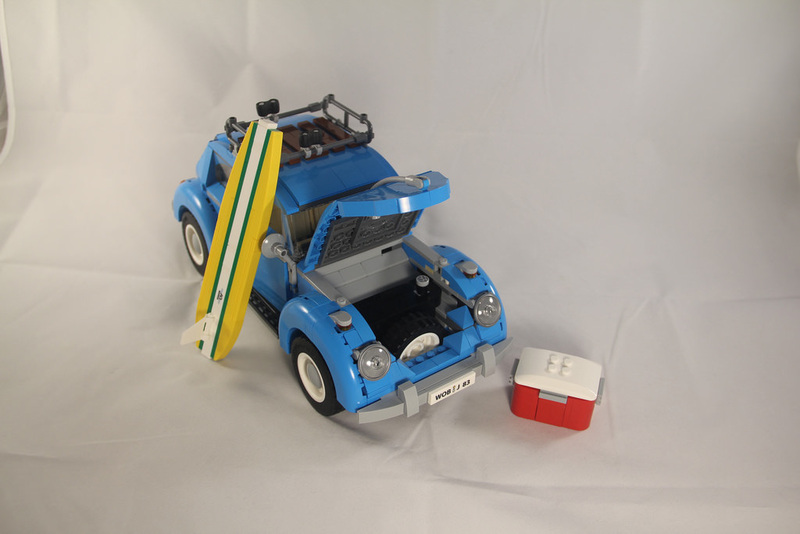 The set does however have a fair amount of interactivity, with the doors, bonnet and boot able to be opened, the roof is removable, the seats that fold forward, as well as the full eski and surfboard. It’s not a terrible set in terms of swooshyness, because there’s heaps to look at when you pick it up. Not ideal for driving, but perfect for display! It would have been amazing to see some working steering, but we don’t always get what we want. The build process for this is really enjoyable. You start with the chassis base and rear of the car. The four cylinder engine goes in first, at the rear, followed by the back seat and rear walls and wheel arches. There are already some pretty great build techniques at play here. 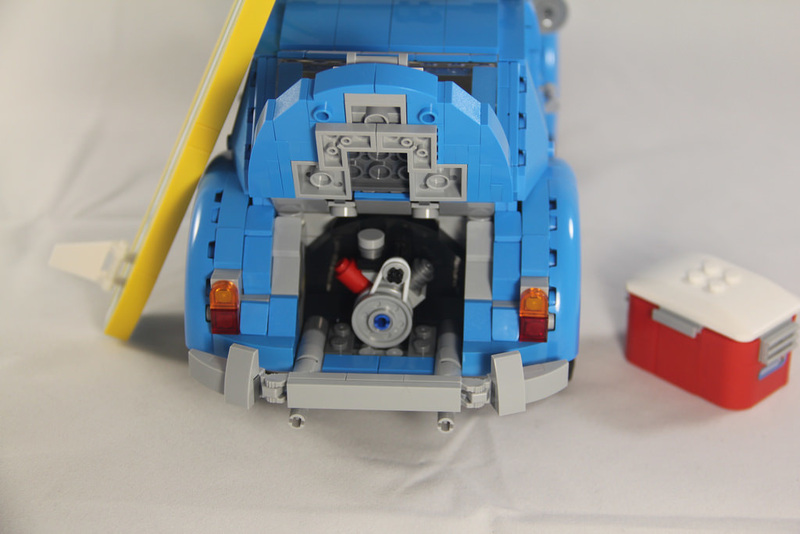 The bags numbered 2 go together to build the front of the car, featuring the fuel tank, spare wheel space, more fenders, and the iconic swooping curve of the front of the vehicle. The front seats are also inserted, as well as the steering wheel, handbrake and gearstick. Then it’s the brickbuilt doors in bags 3. I love how the handles in the interior are phone elements. 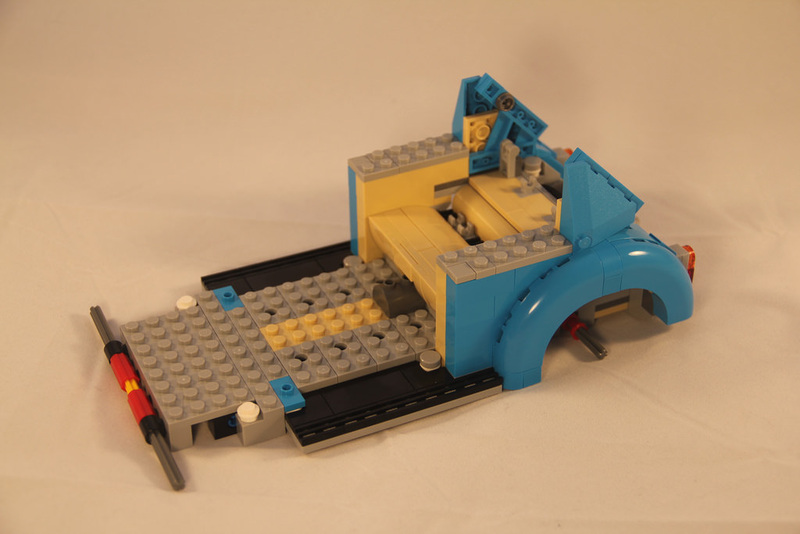 It’s a great use of parts, and even the door trim is neatly executed. The windshield and rear windows have some stickers. The rear stickers are appropriate, and look pretty good, but I’ve always had a problem with the fake pillars on windshields. The Mini Cooper did it too, and it’s ok from a distance, but up close, it looks weird. The next thing to be added is the roof rack and cargo. 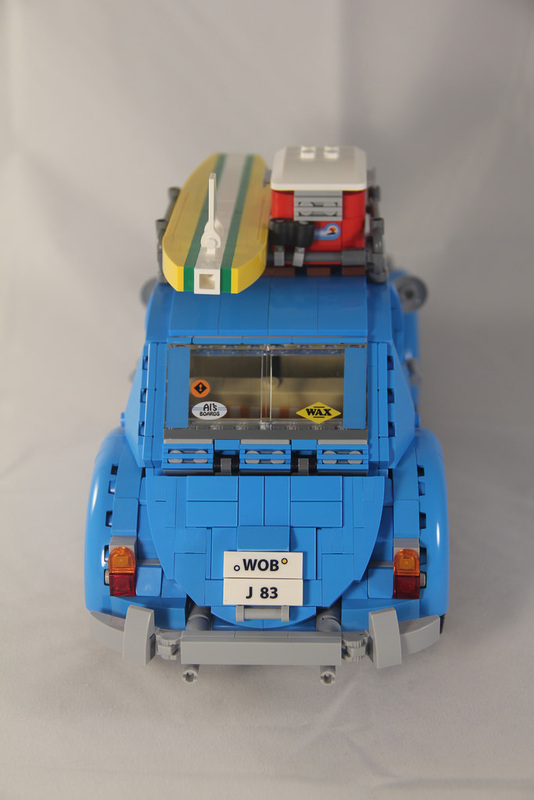 It’s a pretty excellent addition, and it comfortably carries the eski and surfboard. I love the eski. It’s brilliant, and looks spot on. It even has goodies inside, with some drinks, a can, and some ice using trans blue cheese slopes. The designers have even gone to the extent of adding in some rubber Technic elements to stop the eski from moving around too much while driving! Lastly, I have to mention the front hood and the bumpers. The hood (or bonnet here in Oz) is absolutely gorgeous. It completes the shape of the car, and fits really well – a truly brilliant design. The bumpers are great too, as well as the diffrent number plates. The improvement here over the Kombi is that there are even extra plates, not just surplus stickers with nothing to stick them on. You get plates from California, Germany, the UK and Australia. I of course went with the Aussie plates. The final step is the wheels and iconic dome hubcaps, and you’re done! Time to marvel at the finished product. This set is spectacular. It draws the eye to it straight away thanks to the colour, and the details, even the shape are near perfect. 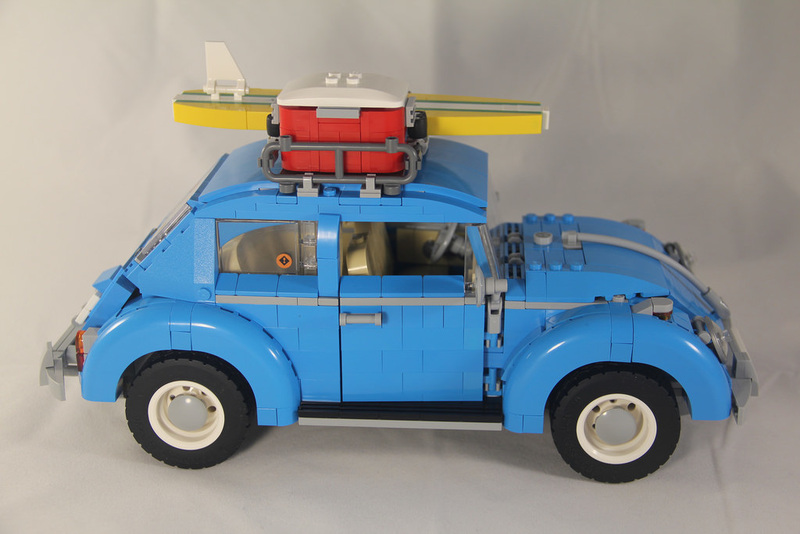 It’s tough to get the right curvature for a Beetle with LEGO, but they’ve pretty much done it! The functionality is a great addition – I change my display pretty regularly now to just keep it fresh, and the inclusion of the eski, towel and surfboard add that little bit extra. 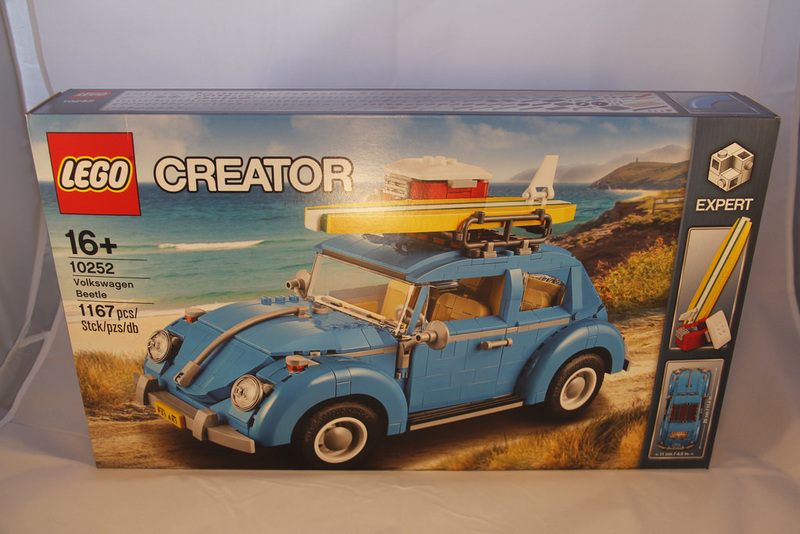 This set is still available from the LEGO Shop Online, for $149.99, and it is well worth the money! It’s a beautiful set, and I honestly thought it would be a little more expensive, so for $150 it is very good value for money. I’ve been hitting the large scale vehicles pretty hard lately in order to properly compare them, and this one is a must for your collection. Great parts, a fun build experience, and a beautiful end result means the collectibility of this set is through the roof. It’s definitely worthwhile getting this set. 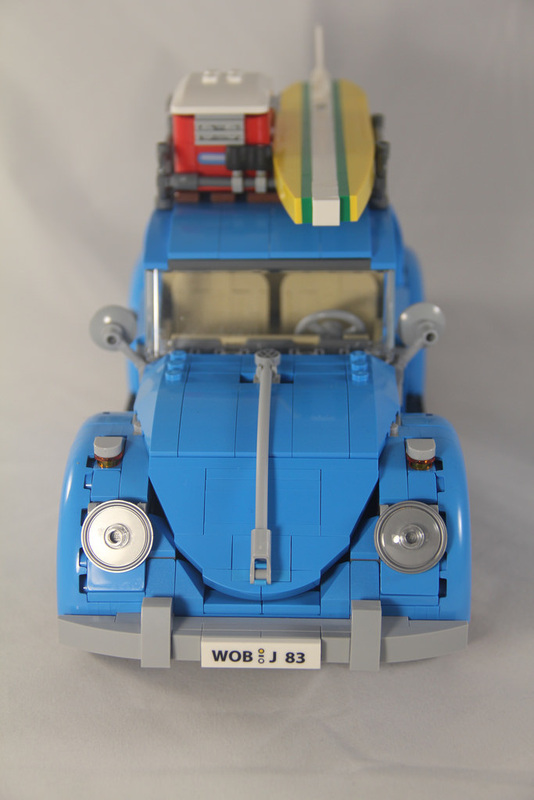 I recently built this set myself and love to have it on display next to the VW T1 Camper Van, the Mini Cooper Mk VII and the Ferrari F40. Too bad the bumpers are in dull grey instead of silver-metallic, like the Mini Cooper has. That would have made this car look even better! But I guess it would also have made it more expensive and that’s probably why LEGO have decided against it. I’ve got the F40 on my build pile and the Caterham coming as well, so I’ll have all the latest vehicles soon. Should be a great display piece. The F40 was a very satisfying build. I actually enjoyed it more than the Mini Cooper! It’s also a wonderful display model and I highly recommended it.